On March 8, or International Women’s Day, a 9-year-old boy in southeastern China tried his best to please his mother, only for his efforts to go unnoticed as she was glued to her smartphone all day. The boy’s experiences came to light first as a school writing assignment, then on Chinese social media, where it went viral and spurred emotional outpours from thousands of commenters about the impacts that smartphones are having on society. “Today is International Women’s Day,” the text reads, “so I’d like to thank the hard work my mom does every day and do something for her. First I told her a story, but mama didn’t seem to like it and kept looking at her phone. My mood worsened. Then I thought she might appreciate it better if I were to congratulate her. “I congratulated my mother, but she still stared at her phone, which made me even sadder. So this doesn’t work either, I thought. I will just have to give her a back massage. So I pounded her back with my best efforts, but she was still looking at her phone without a single smile. I was really sad now, so I decided to wash her feet. The post on China’s Sina Weibo social media site got over 9 million page views in less than a day, according to a report by Taizhou Evening News in Zhejiang Province, where the boy and his family live. With nearly one cellphone for each of its 1.3 billion people, China is just as susceptible to the downsides of the smartphone age as any Western nation. 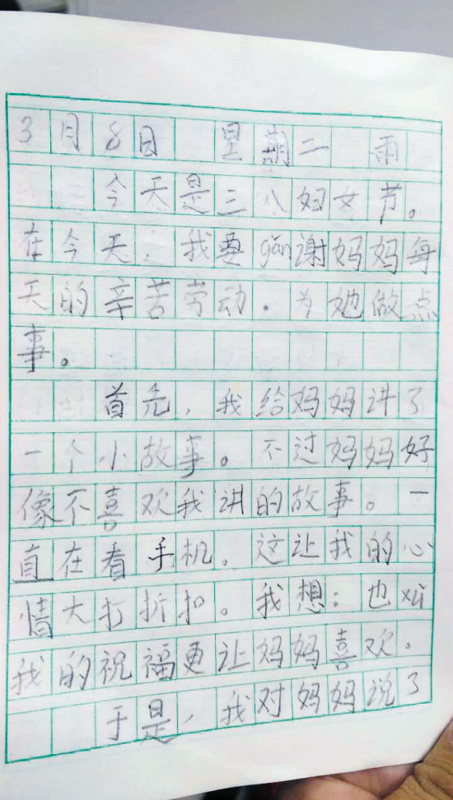 “When I read my son’s diary, I looked at my husband and we broke out laughing, but I immediately felt ashamed,” said the child’s mother, surnamed Zhao, in an interview with Taizhou Evening News. Mrs. Zhao admitted that she and her husband like to frequently play games or check social media on their phones, and that she sometimes gets impatient when her son asks her for help on his homework. “I didn’t realize that my behavior was having such a big influence on my son’s growth,” Zhao said. She will have to put down the phone and spend more time with her son, she said. 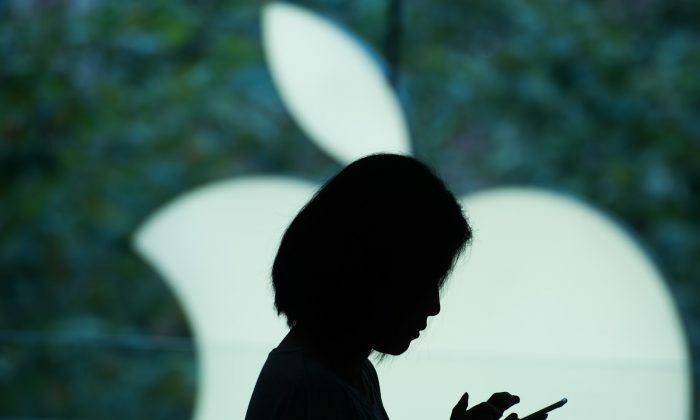 Responding to the 9-year-old’s “cute but heart-rending” diary entry, as one online comment put it, Chinese social media media users commented about the impact of smartphone addiction on children and drew from their own experiences. Taizhou Evening News also interviewed students at the same school that Zhao’s son attends, and reported that 70 percent said their parents were also dependent on their devices. “They look at their phones when eating, when I do homework, and even when lying in bed before going to sleep,” one student said. Seeing his parents playing on their phones gives him an incentive to finish his work quickly so he can play as well. An angry first-grader said: “I think my mom likes her cellphone more than me and she pays more attention to it.” She said that sometimes her mother doesn’t even respond to her cries when looking at her phone. Not just children, but adults too can feel alienated by excessive phone use, as one personal anecdote details.